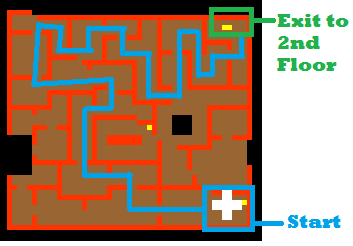 The Banshee Quest is a somewhat maze-like quest, consisting of two quest lines. 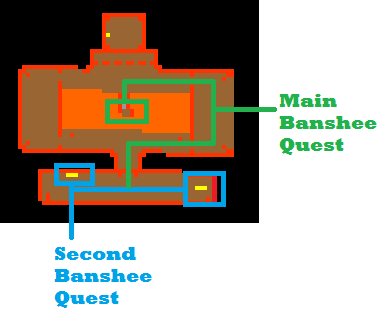 There is a main banshee quest, where you go to kill the Banshee Queen, and the second banshee quest, that has a separate set of rewards. 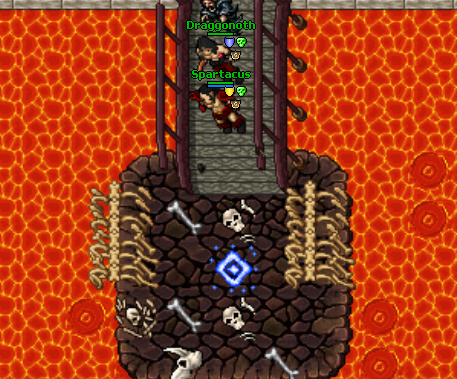 The Banshee Quest requires players to fight their way through two floors of monsters to reach the third floor. Once you reach the third floor, you get to choose which way to go. 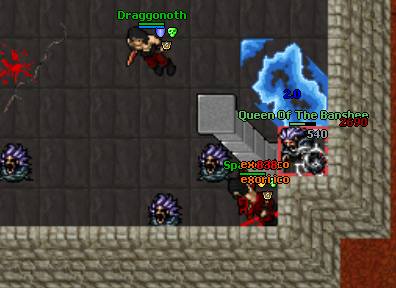 Through the experience doors on the north wall of the room, is the Banshee Queen and her horde of banshees standing between you and riches. Up the stairs on the far left of the room leads to the secondary quest, which is quite a bit less difficult. 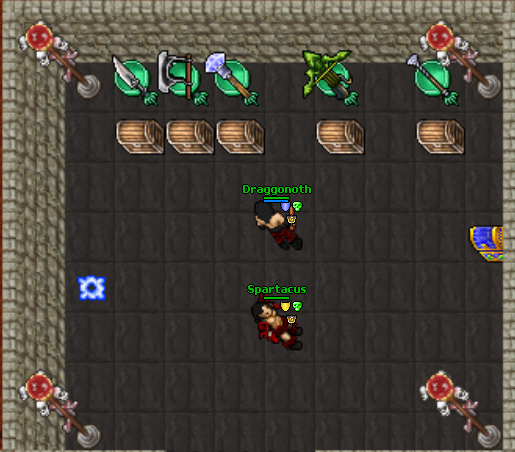 It is recommended that you do the secondary quest first, then return to do the Main Quest once that is finished. 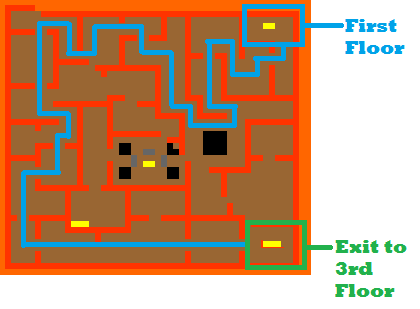 While you work your way around the map, descending to the third floor be aware, banshees will run when low health, and they also heal. "Exevo gran mas frigo/flam" will probably be a casters best friend in this area, as the monsters here do not have a large health pool, but there are large quantities of them. They will teleport you into a room with a few Banshees and Vampires, 'frigo' these down and collect your rewards before entering the portal in the corner. 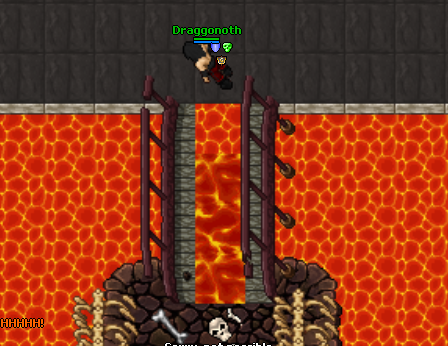 Once you leave the Side Quest area you will be back on first floor, and have to work your way back to the third floor to continue with the Main Banshee Quest. 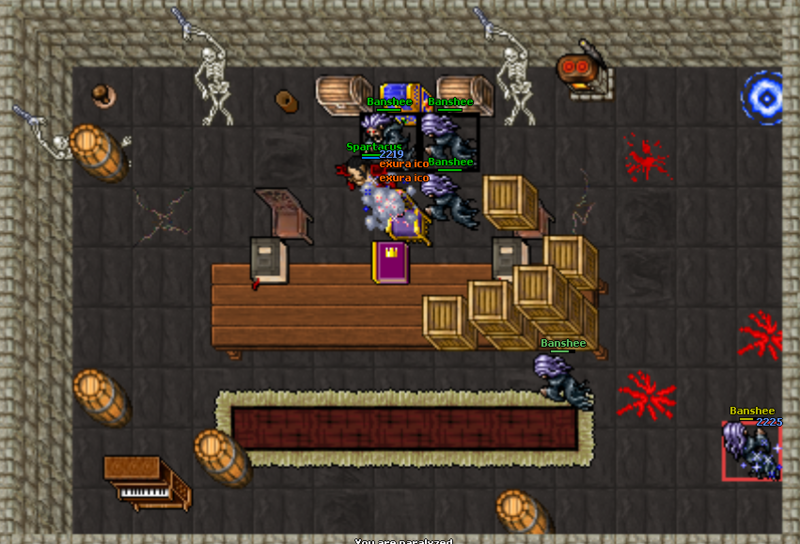 During this quest you should have a blocker and a few mages of a decent level to negate any real danger from the large amount of Banshees in this room, as well as the Banshee Queen.